The cookie urge got me again! I actually made these cinnamon and white chocolate chip cookies a little while back already, but I didn’t get around to writing up the recipe before now because it’s been a busy month. I’m participating in Camp NaNoWriMo this month and my goal is to write 30,000 words on my novel throughout April. It was going really well, but I haven’t written much in a few days and I’m a little stuck in the story… But I hope to figure that out soon! Besides that, I’m also participating in the Magical Readathon all month! It’s an amazing readathon based on Harry Potter and the exams the students at Hogwarts have to take. Take a look at this video if you’re interested! I’ve been having so much fun with it! Anyway, enough about my month – you probably came here for the cookies. These cookies are actually my attempt to cookie-fy my recipe for cinnamon sugar recipes (which you can find here). That one is one of my favourite recipes I ever made (my mouth starts watering just thinking about it) so I figured it’d be fun to see if I could turn it into an equally delicious cookie. Okay, I’m going to be honest: I didn’t like these cookies as much as I did the blondies, but they were still pretty damn good! They are very sweet, so if I make them again I might add some pecans or walnuts to balance out the sweetness of the white chocolate. But if you love sweet, you’ll love these! 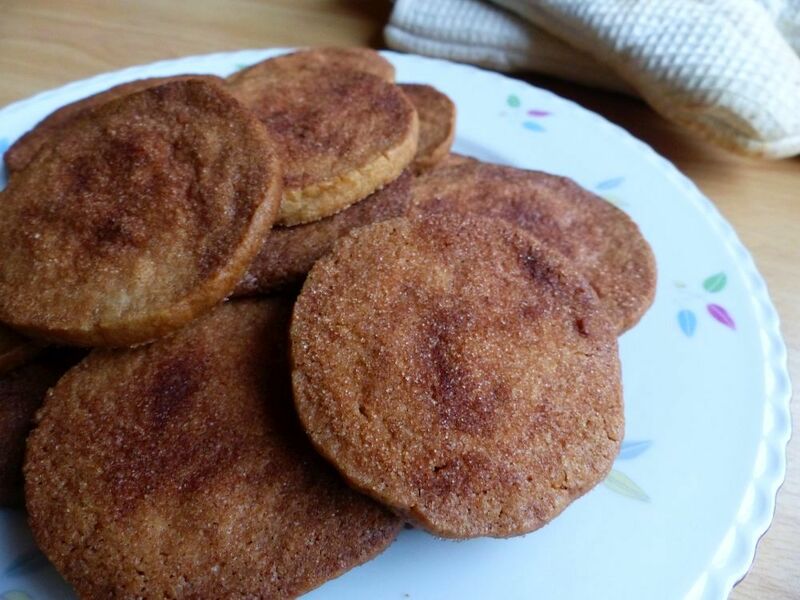 They’re easy to make and super cinnamon-y – what more could you want? Every once in a while I get the urge to bake cookies and it won’t go away until I’ve actually baked said cookies. So, that’s what I did this weekend! I came across the idea of chocolate chip cookies with a hidden Rolo (= caramel) surprise inside of them and that sounded so awfully delicious that I couldn’t get the idea out of my mind. I used my own recipe for chocolate chip cookies and simply added the Rolos in the middle. It’s a very easy recipe, although it does take some time; if you want to make them come out as delicious as possible, the dough should be chilled for at least 5 hours. I usually make the cookie dough in the evening and bake the cookies the next morning. Just looking at the pictures of these cookies makes me incredibly happy. They look so cute and festive! Plus, I know how they taste as well and let me tell ya; they are delicious. These cookies are a huge success all around. This is the first time I made royal icing myself. Last year, when I made gingerbread cookies (which looked similar to these chocolate cookies) I bought ready made royal icing, because I couldn’t find a place to buy corn syrup. This time I had a little more time and did a little more research, and I found out you can just as easily use golden syrup, which I’ve got lying around in my cupboard anyway. The icing is super easy to make, and the mint really takes it up a notch. The cookies themselves are wonderful, too. They’ve got a very rich chocolate-y taste and the texture is just right as well. And like the icing, they’re super easy to make! Just make sure you’ve got some time, because the dough will need to chill in the fridge for an hour. Apart from that, it’s a quick recipe with standard ingredients. Perfect for the Christmas holidays! These brownies are more commonly known as “slutty brownies” but I don’t like that name, so I went for “decadent three-layer brownies” instead. It’s still the same type of brownie, though: a layer of cookie dough covered by a layer of Oreos covered by a layer of brownie. They’re as good as they sound. Interestingly, though, they taste far more delicious when they’re completely cooled down than when they’re still warm, which is counter-intuitive to me, but hey. You live, you learn. Although there are quite a few steps, these brownies are definitely easy to make. I simply combined two of my other recipes and threw in some Oreos in between. They’re very dense and heavy, though, so I cut these into rather small pieces. But I’m not here to judge: you do you. A little over a week ago I got an email from my thesis supervisor saying I passed my dissertation, and with a very good grade as well! To celebrate this, I decided to bake some cookies (yes, that is celebrating for me), and guys – they might be the best cookies I have ever baked. They’re based on the M&M cookies I did last year, but instead of M&M’s I used dark chocolate chips and pecans and they turned out delicious. I prepared the dough in the evening so that it cool chill over night, and then I baked the cookies the next morning. When they were done, me and one of my friends tried one pretty much straight away, having let them cool just enough so that we wouldn’t burn our mouths. I couldn’t just eat one – I needed more of them straightaway. And that rarely happens with me and baked goodies. Needless to say, the cookies were gone within a day – but let’s make something clear here: I didn’t eat them all by myself (although that would’ve been fine too). I had some more friends over for dinner and they seemed to like them just as much as I did. This recipe is definitely a winner, and I suspect I will make these chocolate chip and pecan cookies quite a lot in the future! A few weeks ago, my favourite biscuits were on sale at the supermarket: cinnamon biscuits by a brand called Verkade (not sponsored, although I wish I was). They’re crunchy and sugary and cinnamony – they’re delicious. I don’t often buy cookies or biscuits at the supermarket, because I always figure they’ll be better if I make them myself, anyway. That’s just a fact – home made always tastes better than store bought. However, these kaneelbiscuitjes (as they are called in Dutch) are among the few cookies I am actually more than happy to buy. I can munch on them all day. Which is exactly what I was doing (probably while watching Friends or New Girl) when I came up with the idea to try and make these cinnamon biscuits myself, to see if they would actually be even more delicious. Cut to this weekend. I’d put together my recipe, put on some Dire Straits, and got to work on the dough. At one point I was afraid it wouldn’t come together, but I added a little bit of milk and kneaded the dough with my hands and it turned out beautifully. This was the second time I used the slice and bake method (rolling the dough into a log and then slicing it into cookies), and because I actually let the dough cool for plenty of time this time around, it worked perfectly! These crispy cinnamon biscuits go really well with a nice cup of tea, or just as a snack whenever you feel like it. I’d definitely recommend giving them a try. Oh, and they’re definitely better than the supermarket biscuits. I’ve got a good one for you today, guys. I wasn’t planning on baking anything this weekend and then I had a huge craving for chocolate, and that could only mean one thing. Time to bake something extremely delicious with way too much sugar. 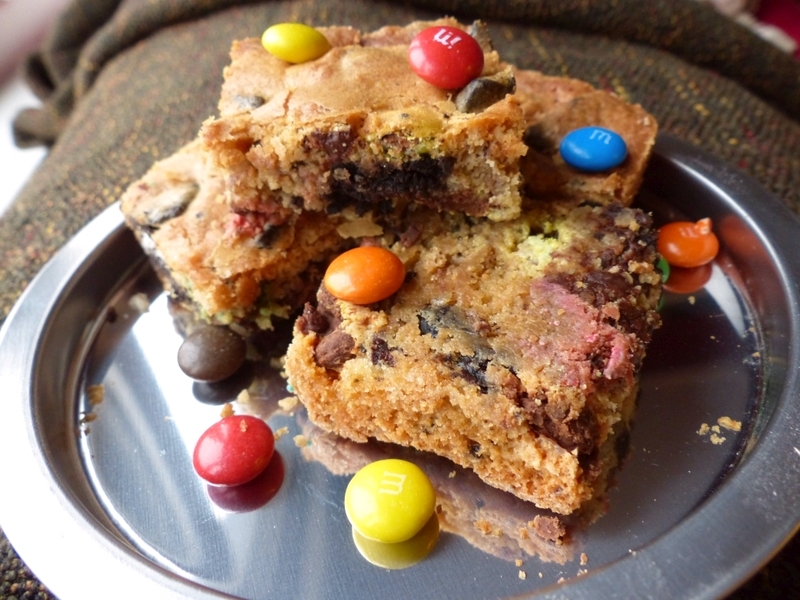 Which is how I ended up with these Chocolate Oreo M&M Cookie Bars. These bad boys pack a chocolate punch. I’ve thrown in Oreos, M&Ms and chocolate chips. As if those first two weren’t enough to get you on a sugar high. The more chocolate, the better, right? My initial plan was to bake Oreo and M&M cookies, but then I figured I had to let the dough cool in the fridge for at least an hour and that was way too much hassle for me on a lazy Saturday. Then I remembered these cookie bars by Averie Cooks, and all was saved. I modified her recipe a little bit and threw in some extra chocolate, with these super easy, super yummy cookie bars as a result!